It’s called an audiogram. But what is an audiogram, and what can it be used it for? An audiogram is the graphical representation a person’s hearing levels as determined by a hearing test, and shows the softest sounds that a person can hear at different frequencies. This makes it quick and easy to identify if a person has hearing loss, what type of hearing loss they have, and if a specific hearing loss solution might be right for them. There are two types of data that are shown in an audiogram: frequency, and intensity. If you’re not sure what these are, just check out the explanations of frequency and intensity of sounds. During a hearing test, a doctor or other hearing professional will play different frequencies of sound at very low intensities. Then, they will gradually increase these levels until the sound is audible. At this point, they will note the loudness at which the sound is audible and then test another frequency of sound. Most hearing tests analyze sounds between 125 Hz and 8000 Hz, and from -10 dB to 120 dB. When the hearing test is completed, the hearing professional will have a series of notes that identify an individual’s hearing. But these notes aren’t very pretty. They often look something like: L 250/20 500/30 1k/60 2k/90 4k/100 R 250/35 500/50 1k/70 2k/90 4k/100, so to make the data more understandable it is put into a visual graphic. 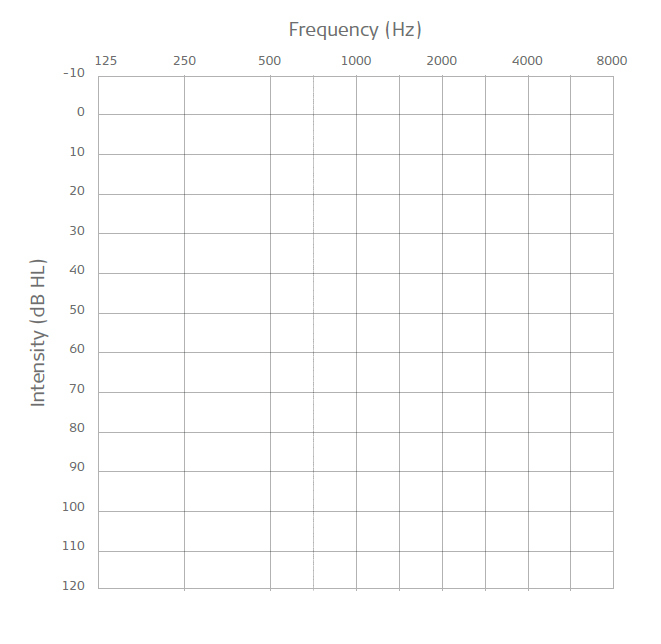 You can see that the frequency is shown on the top, and intensity is shown along the side. As you move from left to right the frequencies increase (sounds get higher), and as you move from top to bottom the intensity increases (sounds get louder). 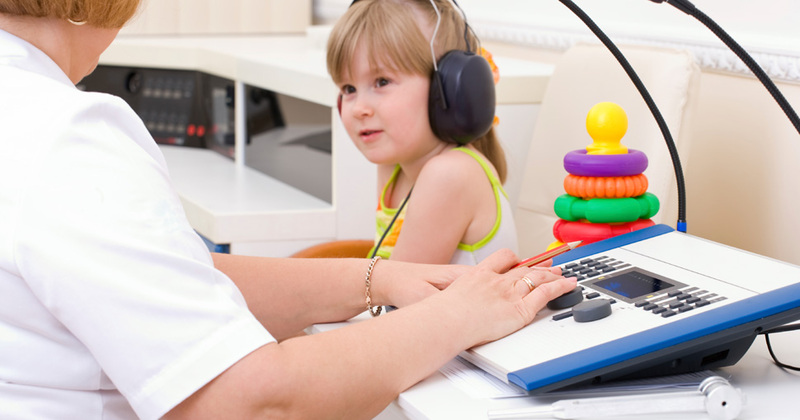 Filling out an audiogram is just a matter of connecting the data provided by the hearing test. 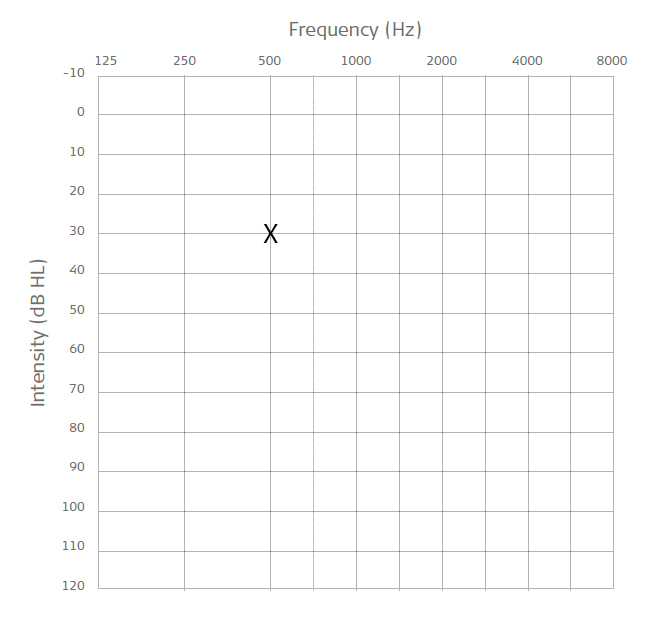 This shows that the individual can hear a 500 Hz tone at 30 dB or louder. 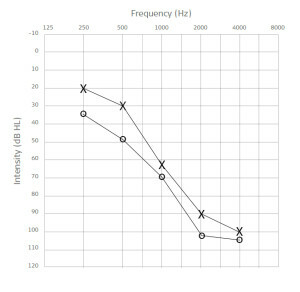 A completed audiogram showing hearing thresholds in the left and right ears. 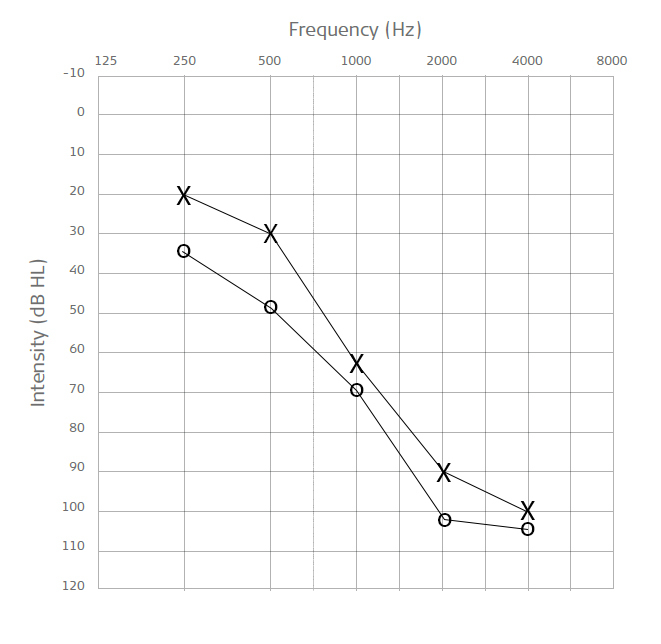 This is the same example audiogram that is at the top of the page. It shows that this individual can hear all sounds below the lines, but none of the sounds that are above the lines. In this case, the individual has a mild-to-moderate hearing loss in the lower frequencies and severe-to-profound hearing loss in the higher frequencies. Additionally, the right ear has a slightly more severe hearing loss than the left ear. Do you know what your audiogram looks like? When is the last time you have had your hearing checked? If it’s been a while you might want to visit your hearing professional to have it checked, or you can use MED-EL’s free online hearing test to get a quick idea.